We’d love your help. 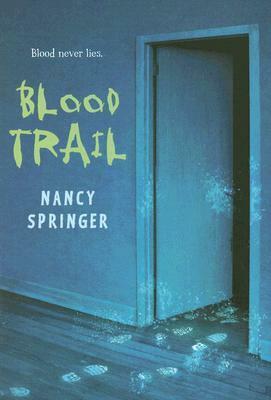 Let us know what’s wrong with this preview of Blood Trail by Nancy Springer. After his best friend is murdered, seventeen-year-old Booger realizes he is the only one who has any idea who might have committed the crime; but he doesn't tell anyone. This novel explores the darker side of sibling rivalry. A Missouri Gateway Readers Award After his best friend is murdered, seventeen-year-old Booger realizes he is the only one who has any idea who might have committed the crime; but he doesn't tell anyone. This novel explores the darker side of sibling rivalry. To ask other readers questions about Blood Trail, please sign up. Blood Trail describes the events of a murder, but it isn’t your typical murder mystery. It goes through the psychology of the town and how the close-knit residents react. It is very short (I read it in less than half an hour) and moves fairly quickly. I enjoyed the book, but once I reached the end, I felt like the book stopped in the middle. I suppose this is how real life works, but for a book, I would like there to be a bit more feeling of having resolved the issue. Reading blood trails was very suspenseful and fast pace and that's what made this book really good, the book is pretty much the thought of a kid going through so much at once and can't let loose all of his feelings. I really enjoyed the book because it kicked off fast and I didn't have a problem reading it. The storyline also is very strong and mixed into one great book. There are some slow parts but they are interesting to read overall the book was pretty good especially the ending. This book is very interesting. It is like a horror book. The blood trail is about a best friend of a boy who was murdered. He thinks he knows who did the crime but he keeps it to himself. I recommend this book to people who likes mystery books. This book was amazing! It was very suspencful, I didn't want to put it down. It has a very suprizing ending so if you like books that are mysteries and have OMG moments,then this is the book for you. I know that this was the book for me because I love mysterie books and ghost stories like this but this was not a ghost story. Great book for some who doesn't like to read. Short and suspenseful. This review has been hidden because it contains spoilers. To view it, click here. Devastating is the impact of a young person's murder in a small town. Springer in short fashion has one feeling the raw emotions. Then she explores with us the dangers of sibling rivalry, a form of domestic abuse. Is this Cain versus Abel again? This short read is quite provocative. This review has been hidden because it contains spoilers. To view it, click here. this book was absolutely amazing. It was simple and thrilling at the same time, and the people, well characters are people that you can relate to. Gossip goes around and it goes around here too so it makes sense to use that as an example to connect to the readers. Good book lol. Quite a bit of profanity and the ending was a bit vague, but as you all can see by my rating this book was still very good! Intriguing, mysterious, and just the right amount of creepy. Hands down one of my favorite books of all time. Its suspenseful and page turning I could not put it down until I read the entire thing! Definitely recommend it if you like horror/mysteries! I picked this book up thinking it was a mystery. It isn't (despite what the cover says). It's really a book about how a boy is changed when his best friend, Aaron, is murdered. It's a very moving book in that way. I really felt for the main character, Jeremy, and the whole time I read the book I kept thinking how horrible it is that some people actually have to go through this experience. What made it worse for everyone involved was that it was clear from the get-go that one of Aaron's family memb I picked this book up thinking it was a mystery. It isn't (despite what the cover says). It's really a book about how a boy is changed when his best friend, Aaron, is murdered. What made it worse for everyone involved was that it was clear from the get-go that one of Aaron's family members (I won't spoil it by saying which one) is the murderer. Blood Trail is about the best friend of a boy who was murdered in a small town. Before he dies he askes his best friend Jeremy to call when he gets home because he is scared of his twin brother, Nathan. He eventually can't take it anymore and tells the police what he was told. In response there is a storm of vandalism on his house, thretening phone calls, and people calling him a traitor because Nathan was the prime suspect in the murder. This book brings to light how one act can have so many con Blood Trail is about the best friend of a boy who was murdered in a small town. Before he dies he askes his best friend Jeremy to call when he gets home because he is scared of his twin brother, Nathan. He eventually can't take it anymore and tells the police what he was told. In response there is a storm of vandalism on his house, thretening phone calls, and people calling him a traitor because Nathan was the prime suspect in the murder. This book brings to light how one act can have so many consequences that are unforseen. Violence:4 There was a very violent Murder. Drugs:There were references, but none of the charactors used them in the story. This book's cover and synopsis gave out an expectation for the story that was the opposite of what it turned out to be. (If that makes sense.) It was stated that Blood Trail was a mystery about a teenage boy investigating is best friend's death, but more than that it was really about his coping with the tragedy. From the beginning of the book you know exactly who it was that had killed Aaron's friend, and most of the book is dedicated to Aaron getting over the death. Still, with the misleading sy This book's cover and synopsis gave out an expectation for the story that was the opposite of what it turned out to be. (If that makes sense.) It was stated that Blood Trail was a mystery about a teenage boy investigating is best friend's death, but more than that it was really about his coping with the tragedy. From the beginning of the book you know exactly who it was that had killed Aaron's friend, and most of the book is dedicated to Aaron getting over the death. Still, with the misleading synopsis and cover, Blood Trail pulled off the story well. I wish it had been longer and had more detail thrown in about what happened to the brother of the boy who was killed. The plot definitely could have had more twists and interesting detail in it, but overall this was a good book. YA. Murder. Fiction. Grief. Mystery and detective stories. A great read for reluctant male readers, as it deals also with football. I read this to see if I could get any pointers for technique of a mystery for middle reader/ YA level readers, especially since I loved this author's book Boy on a Black Horse. But the ending left me hanging, the story seemed very short and jumped gaps of time where nothing interesting must have been happening... not my favorite. More of a YA novel about dealing with grief than one about a murder, as it *spoiler* is never brought to a resolution. A boy's best friend is murdered and now he must decide whether or not to reveal what he knows about who it might be. This book has the crime very close to the front of the book and the reader spends a lot of time dwelling on it. I thought the emotions of the main character were real but that the story (conclusion?) wasn't as sharply in focus as it could have been. Truly tragic idea of a story but not executed very well. I give it a C.
I think this book is most appropriate for 5th graders and up. It does contain some gross references since its a book about murder. This book shares a story about mystery and suspense. There were scenes in this book where I was very grossed out, so therefor I do not recommend this book for people who are easily discussed and not ready for horror. I recommend this book to people like me who like mystery, suspense, and some horror. I give this book a 3 star rating because the cover makes you think that this book is a mystery but it isn't. I wished this book was longer and more descriptive. I honestly didn't like this book. I wouldn't recommend this book because it gets you disappointed. In the middle of the book it kind of gets interesting but then it starts getting really boring at the end. This book is about a boy whos best friend is murdered. Before he was murdered he told his friend that he was scared to go home. His friend is hiding something though, something that might reveal the killer. It was a good book with a lot of suspense. It was a good book, but not one dying over. It isnt a definite read. More like a quick read that is enjoyable. Booger enjoys life as an athlete in a small coal town with his best buddy Aaron until Aaron is brutally murdered. All leads point to Aaron's bookish brother Nathan. By sharing what he knows with the police, Booger manages to incur the wrath of most of his neighbors--especially Aaron's parents. I was hoping for more action, and the story was left largely unresolved. This book was so random and depressing I found myself needing some sunshine when I finished it. This is NOT a mystery. More a book about coping with devastating situations. And the language is pretty foul. Poor Booger: why in the world would he keep that nickname?! Jeremy and Aaron have been best friens sicne second grade. On one of their many afternoons togetehr, Aaron confesses that he has become afraid of this twin brother nathon later that day, Aaron is found dead. Was nathan the murderer? It is up to Jeremy to find out. I liked the mystery part of this book and trying to figure out if Aaron's brother really killed Aaron. I didn't like the ending though because it left you hanging, and you never found out if the brother really killed Aaron. i would give this book 4 stars. This title was a quick read and hooked me in pretty good. I thought the story was very attention grabbing but I felt the end needed something else. It's not a bad ending but could have been a little longer I think. I thought this book was retarded. It is really boring because nothing happens. I listened to about half of it, and then skipped to the end to see if maybe there was a cool twist or something, but nothing. Plus the writing isn't very good and all the characters have stupid names. this was a really good murder mystery. If u like mysteries then you need to read this. It is about a little boy who his best friend get murder in his own house.The friend of the little boy that got killed thinks he knows who killed his friend but doesn't want to get in trouble. It started out with great potential, but the book is so short and doesn't resolve very well at the end. I think it would have been better if the book was longer. This book had a strong narrative voice and I had high hopes for it. Unfortunately, the ending was so disappointing I could not recommend it to a student. I really enjoyed this story. I thought it was a mystery triller, and really gets you thinking.